GMA Network (Global Media Arts or simply GMA) is a major commercial television and radio network in the Philippines that is owned by GMA Network Inc., a publicly listed company. Headquartered on GMA Network Center, Diliman, Quezon City. The following is a list of all television programming that GMA Network is currently broadcasting since it began its television operations in 1961. Newscasts are produced by GMA News. Documentaries, informative and public affairs programs are produced by GMA Public Affairs. While the rest are produced by GMA Entertainment Group except when noted. For the previously aired defunct programs of GMA Network, see list of programs aired by GMA Network. Mike Enriquez, anchor of the newscast show, 24 Oras and host of the investigative documentary show, Imbestigador. Marian Rivera, host of the variety show Sunday PinaSaya and the drama anthology show Tadhana. 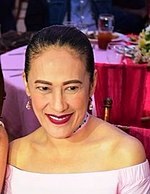 Ai Ai de las Alas, host of the variety show Sunday PinaSaya. Dingdong Dantes, host of the informative show Amazing Earth. Barbie Forteza, actress of the drama series Kara Mia. 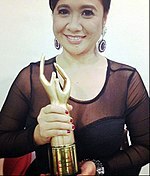 Eugene Domingo, lead actress of the comedy anthology show Dear Uge. Jessica Soho, host of the magazine show Kapuso Mo, Jessica Soho. Note: Titles are listed in alphabetical order followed by the year of debut in parentheses. Note: Titles are listed in alphabetical order followed by the year of debut and region/s where the show airs in parentheses. ^ "GMA-7 REWARDS VIEWERS WITH CUTTING-EDGE PROGRAMS IN 2018". The Daily Guardian. January 3, 2018. Retrieved January 20, 2018. ^ a b c d e f g h i j k l m n o p q r s "Friday Schedule GMA Entertainment". Retrieved August 3, 2017. ^ a b c d e f g h i j k l m n o p q r s "Saturday Schedule GMA Entertainment". Retrieved August 3, 2017. ^ a b c d e f g h i j k l m n o p q r s "Sunday Schedule GMA Entertainment". Retrieved August 3, 2017. ^ "'Stories for the Soul,' ngayong October 29 na!". Retrieved July 14, 2018. ^ a b c d e f g h i j k l "#PusoAngMananaig". Retrieved January 1, 2019. ^ a b c d "Monday Schedule GMA Entertainment". Retrieved August 3, 2017. ^ "Thursday Schedule GMA Entertainment". Retrieved August 3, 2017. ^ "Wednesday Schedule GMA Entertainment". Retrieved August 3, 2017. ^ "Tuesday Schedule GMA Entertainment". Retrieved August 3, 2017. ^ "GMA Davao Rolls Out "Byaheng DO30" With Mayor Inday Duterte". Page One. December 14, 2016. Retrieved December 15, 2016.